Who could forget how Jose Mourinho’s fascinating relationship with Manchester United started, a blur of fire and flamboyance as he dashed down the Old Trafford touchline after his Porto side knocked Sir Alex Ferguson’s men out of the Champions League in 2004? Much has changed since Mourinho became an instant idol for the British media, a perfect combination of talent and charisma, as he went on to prove during just over three years at Chelsea where he won two Premier League titles, an FA Cup and two League Cups. During that time, he largely got the better of Sir Alex, whose record against Mourinho stands at just two victories in 14 head-to-head matches against the Portuguese. Mourinho is further than ever from being secure at Real Madrid. In the past it was the media or opposing coaches and teams that felt his wrath. Now he’s crossed the line with his own players. Casillas, Ramos, Ozil, Di Maria, Marcelo and even Ronaldo have had their disagreements with Mourinho. His reputation with the fans is hardly stable, either, having clashed with supporters on more than one occasion this season. The unrest off the pitch is accentuated by poor results on it. Real Madrid are suffering a catastrophic season in the league with Barcelona 16 points clear and although they are still alive in Copa del Rey and the Champions League, there doesn’t appear to be the confidence that they can win both. 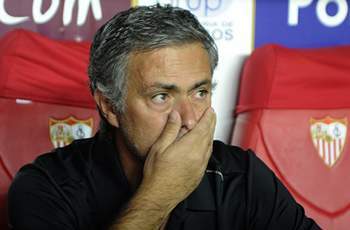 Fail to win a trophy at all and Mourinho may not be spared the luxury of another season in the Bernabeu hotseat. Yet the relationship between the two managers has recovered from the rumpus of 2004 to such an extent that the self-anointed ‘Special One’ has emerged as one of Ferguson’s two preferred candidates to succeed him. The pieces of this particularly complex jigsaw, however, don’t quite fit. Not only is Mourinho’s stock falling due to Madrid’s disastrous recent results but Sir Alex is defying his 71 years and has hinted that he will delay his retirement for at least another two or three years as United close in on a 20th English title. The Scot, who operates on a one-year rolling contract, will have the final say in deciding his own successor, and Goal.com revealed last year how he had identified Mourinho and Bayern Munich manager-in-waiting Pep Guardiola as the two best-placed candidates to continue his legacy. “It’s very difficult as names have been bandied about and football is precarious,” Sir Alex remarked in January. “You could be talking about one of the potentially exciting young managers – is he going to be here in two years? The answer to that point, in Mourinho’s case, is “not at Real Madrid” – and nor, it seems, at Manchester United. While Sir Alex is a huge admirer of the Portuguese’s skill, it is not a view shared in the United boardroom where senior figures harbour concerns, feeling that he could be too high-maintenance, both in terms of his transfer-market demands and capacity for courting controversy. It is a theory that has been borne out by the deterioration of Mourinho’s relationship with Madrid president Florentino Perez as well as senior figures in the dressing room, most notably captain Iker Casillas, who he dropped for two games earlier this season. He is also seen as the antithesis to the long-term squad-building approach taken by Sir Alex over the last 26 years, a quick-fix manager who plays pragmatic football to win trophies but then leaves clubs in a mess after two or three years. Mourinho would certainly have to accept the financial constraints of United’s £350m debts both in terms of restricting big transfer spending and his own salary. He is currently the highest paid coach in world football on £12m-a-year at the Santiago Bernabeu, more than double Ferguson’s salary. Whether Mourinho fits the Old Trafford bill or not, the pair undoubtedly enjoy a special relationship and will continue to do so wherever the Portuguese ends up once his tenure at Real Madrid ends. Indeed, when the Spanish champions were in Manchester to face City in the Champions League group stage in November, the pair made sure to catch up for a cup of tea at the Lowry hotel and the mutual praise has rolled off the tongues of both bosses in the build-up to their upcoming clash. “I have always had a fantastic relationship with him and I am proud of it,” said Mourinho ahead of the tie in an interview that, interestingly, he went out of his way to give to MUTV while at United’s clash with Everton on Sunday. “Of course, I want to win and he wants to win but I believe the loser will have a little bit of space to feel a little bit happy because of the friendship. In the background to Mourinho’s eulogising of Sir Alex and United there are questions surrounding the Portuguese’s own future as the 50-year-old considers his next career move. It increasingly appears that the former Chelsea man will leave Madrid at the end of the current campaign, his third season at the helm at the Santiago Bernabeu, the Spanish title already out of reach with his side a massive 16 points behind leaders Barcelona. Indeed, all of Mourinho’s eggs are firmly planted in the Champions League basket as he chases ‘La Decima’ – a 10th European title for the most decorated club on the continent. The 50-year-old has fallen out with several key players at Madrid, including Casillas and Sergio Ramos, while he has alienated much of the club’s fan-base and fallen out irreparably with influential figures in the local media. He may have beaten Barcelona to the La Liga title last season but Mourinho could well find himself facing the sack if his side are dumped out of the Champions League by United in the first knockout round. To that end, his agent, Jorge Mendes, has already been in touch with potential employers for next season, with Mourinho making no secret of his desire to return to the Premier League one day. Chelsea, City and United are all considered potential destinations, along with Paris Saint-Germain, and the former Inter coach has indicated a desire to take over at Old Trafford from the man to whom he refers to as “boss”. But the next United manager? That prospect continues to diminish.